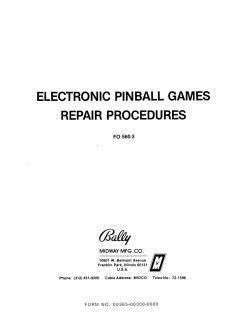 "Bally Electronic Pinball Repair Procedures" has been added to your cart. 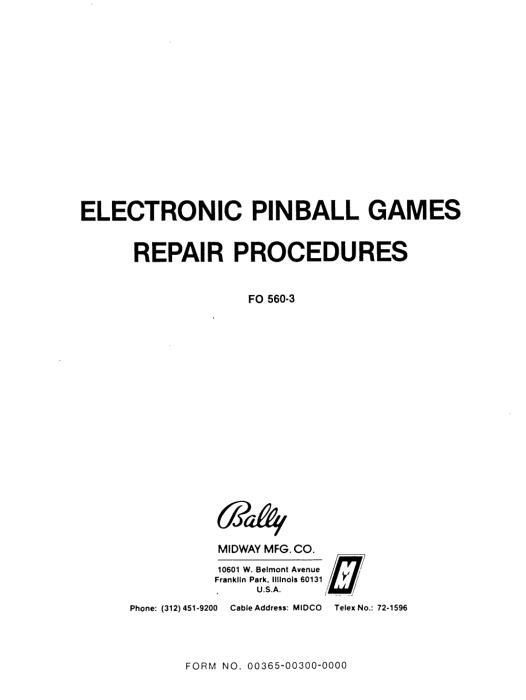 92 page factory repair manual FO-560-3 for the very popular BALLY and early STERN electronic coin-op games made from 1977 through 1982. It has two sections of troubleshooting instructions for isolating problems to both the module and component level. Includes pictorial guide and parts lists (but not schematic diagrams) of all major electronic assemblies. Also includes Theory of Operation & Troubleshooting section for BALLY sound modules. One of these books was shipped in every new BALLY machine made in this era, but most seem to have disappeared just when you need them most. This is the single most useful document for taking care of your 77-82 BALLY or STERN electronic pinballl machine. NOT CURRENTLY AVAILABLE. Listed for reference.